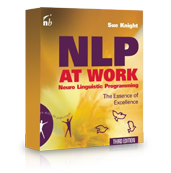 Whether you are a newcomer to NLP or an experienced practitioner there is something for you here. The underlying skills and concepts – how to recognise unique styles, the essence of modelling excellence, the keys to discovering greatness through non verbal behaviour and language, questioning skills and keys to our unconscious mind…. All of this is followed by ways in which we can use these concepts in building relationships, enriched communication, resolving conflict, negotiating a WIN/WIN. All of this is backed up with thought provokers and exercises for your own development. Trainers and coaches the world over use this book as the basic training reference and material for their work and various organisations have issued copies to every member of their staff as a must read for success in business. "We don't need a list of rights and wrongs, tables of dos and don'ts: we need books, time, silence. You must not is soon forgotten, but Once upon a time lasts forever."